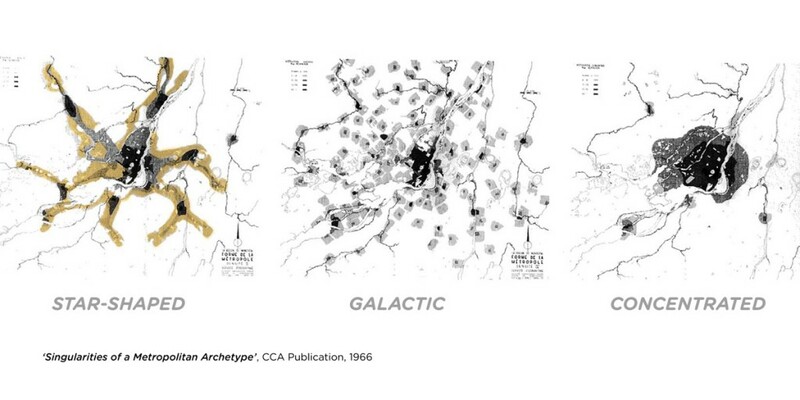 The CCA publication, ‘The Singularities of a Metropolitan Archetype’, shows a series of figures prepared in 1966 by the City of Montreal Planning Department modeling hypothetical plans for 10 million inhabitants: the star-shaped metropolis, the galactic metropolis, and the concentrated metropolis. The concentrated metropolis prevailed. 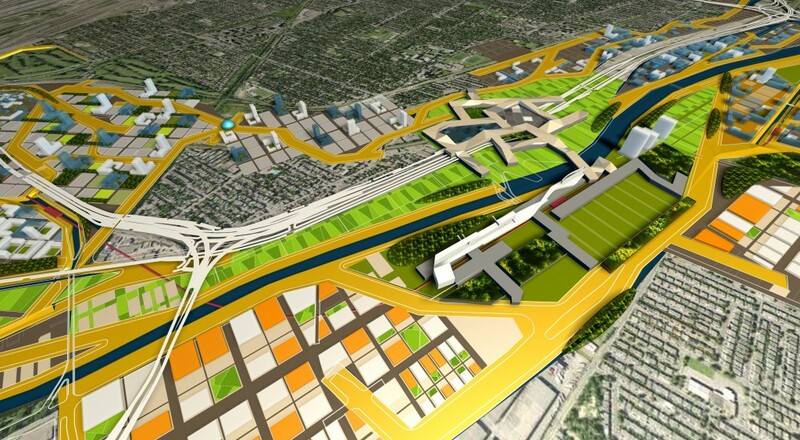 Meanwhile, the international corridor from airport to downtown is ‘other’: a vast residual territory of unrealized land value as a new city form. 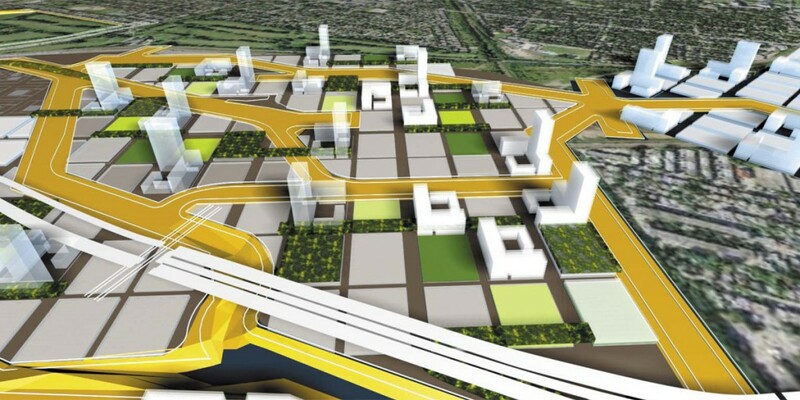 Today we explore a model that more resembles the first of these figures – the star-shape – to make a new topographic territory of infrastructure as an asymmetric adjacency to the hovering Autoroute 20. 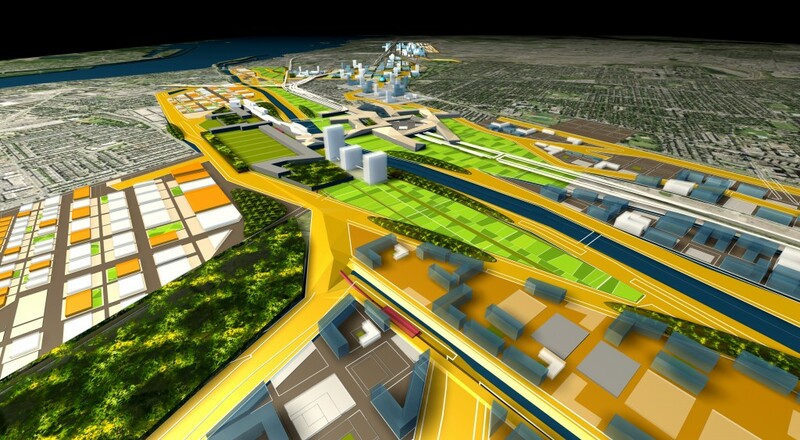 This new territory, which we have named Undercover Montreal, has been carved through the international gateway corridor lands to create a bundling of inhabitable, infrastructural entities co-evolving, adjusting, and transforming– public park land, cyclist and pedestrian throughways, public transport of subways and raised rapid transit, with the reinvigorated Lachine Canal, water storage and flow. 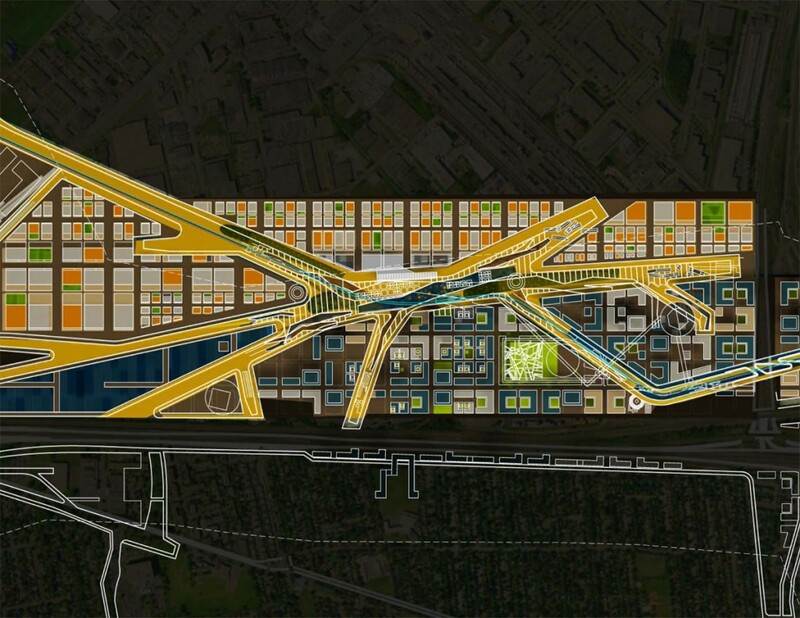 This all converges to make a 17 kilometer continuous heterogeneous edge from the Montreal / Trudeau airport to the tunnel entrances into downtown Montreal. 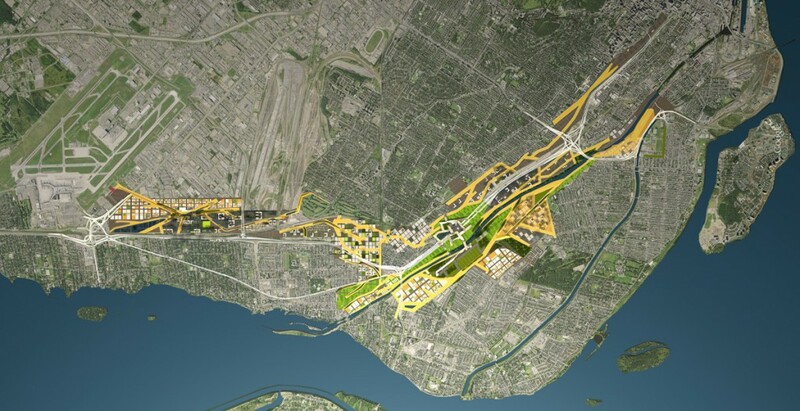 The fingers of Undercover Montreal have been determined as a fine-grained complex topography moving through an urban territory, as a potential ‘cover network’ placed, at one level, adjacent to existing neighbourhood areas and meshing with lost ravines, railway spurs and trails. At another level, these infrastructural routes extend outward across the larger metropolitan territory as an organizer of new large assemblages of selected self-stimulating public open spaces, residential, industrial and commercial intensified areas. These ‘chunk’ assemblages re-position and re-translate existing precincts of older industrial zones and large suburban malls to a second higher level of functional integration. 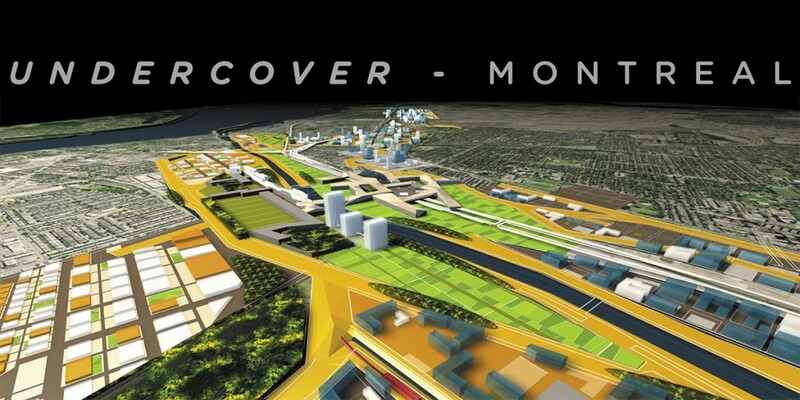 Undercover Montreal, explored and sited through a carving of the present territory, is a new isotropic form. 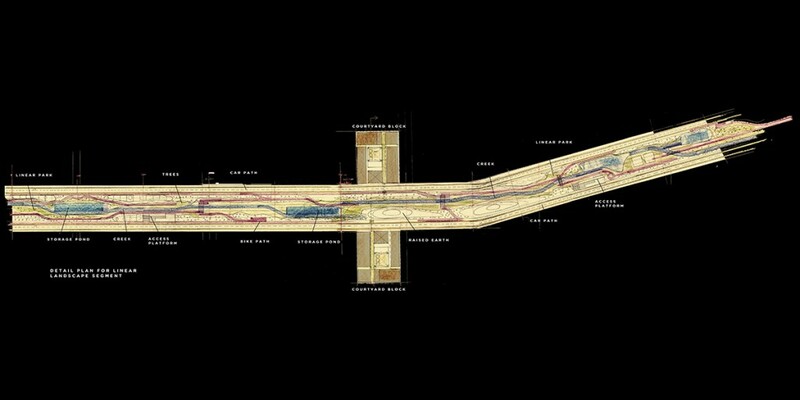 It forms a constant adjacency along its length where it moves both submerged below, rising to co-planar and hovers above, connecting public spaces and inserting a new subway system and neighbourhood precincts. 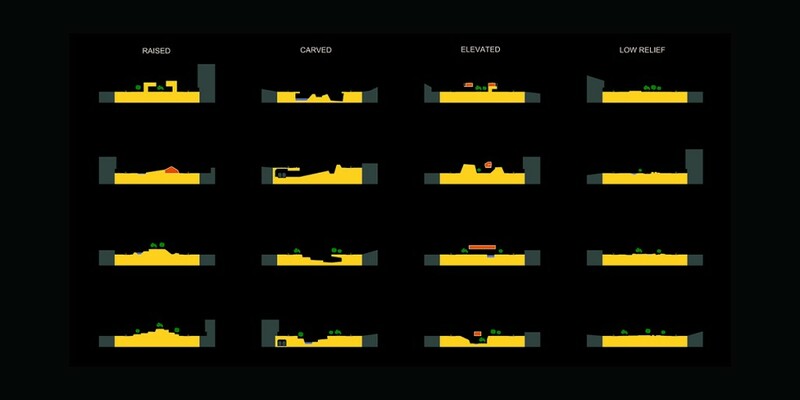 Its fingers – ‘jet streams’ – make new spatial types, defined as ‘strings’ and ‘large chunks’, that are directly engaged. 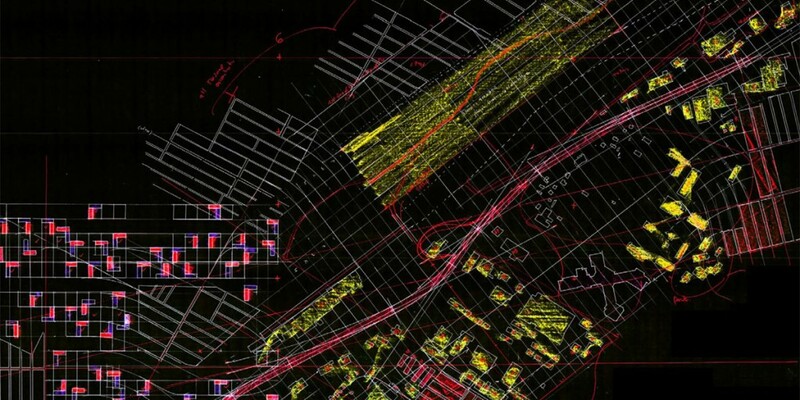 They are provocative instigations for novel growth that is closely tied to the new topography of infrastructure in a co-evolving dynamic process that is self-sustaining and self-stimulating. The ‘large chunks’ are characterized through a number of heterogeneous programs defined as ‘soup assemblages’ and ‘filigree fogs’ of open spaces and built form. 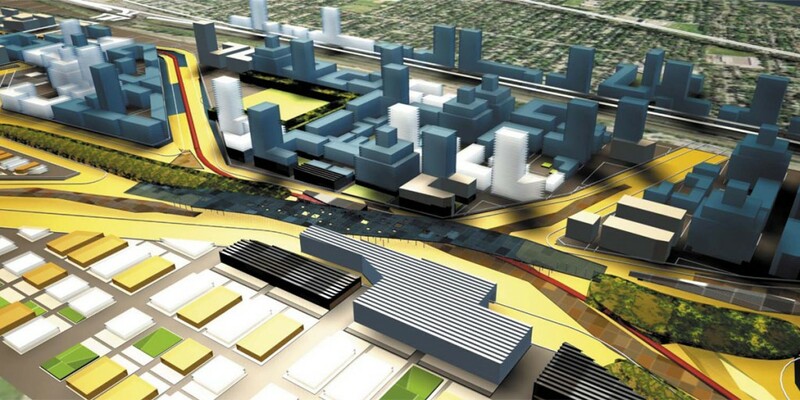 These are made in turn by reconfigured industrial zones where present sprawling areas are rationalized to be more ecologically compacted with shared infrastructure, expansive zones of greenhouses, fields of solar collectors, dense residential mixes of high-rise and courtyard housing, and new propositions of commercial programming of entrepreneurial building types. Also re-positioned is a transformation of the present suburban shopping mall (large mass surrounded by asphalt) to ‘lifestyle mall’, a city centre superimposing a larger framework of shopping galleries, courtyards, parking structures and adjacent hotels, straddling the expressway and connecting the edges of the international corridor and adjacent neighbourhoods. Similarly, the Lachine Canal, currently immobilized on its edges by a contiguous road and green fringe, is strengthened by making contact in less passive ways with new sites, frontage, and docking facilities, reviving it as a waterfront and essential component of the new networks’ organization. The ‘strings’ of Undercover Montreal are gatherers of random grammars, lines of intensity and connection, traveling, ascending, descending, and bridging through the infrastructural network. Strings link neighbourhoods to transit stations to cycling paths to lines of trees and linear parks, to shopping and work places. 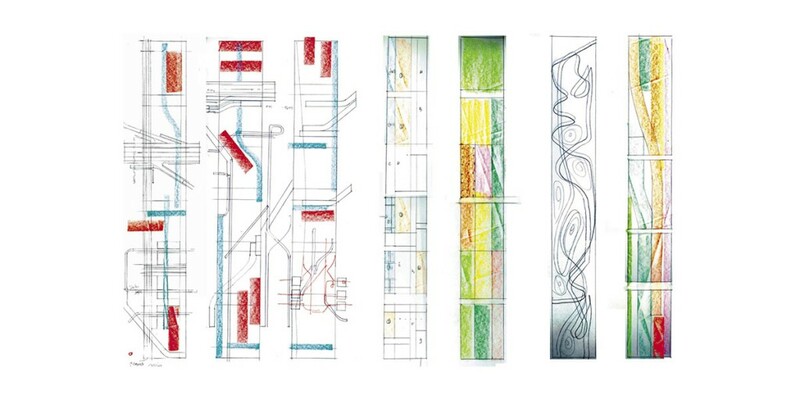 Strings, characterized as ‘jets’, ‘lightning bursts’, and ‘mushrooms’ are contiguous alignments made of terraces, stairs, ramps, landscape forms, nodal linkages of buses, waterways, subways and trains – creating, maintaining and intensifying new relations. 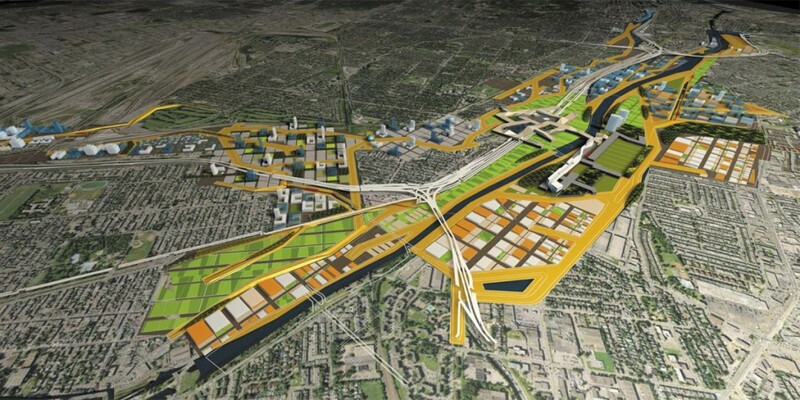 The large scale of the patchwork of ‘chunks’ provides a strategy of development for the international gateway corridor that has the potential to provide corresponding capital for the ongoing mirrored development of Undercover Montreal. 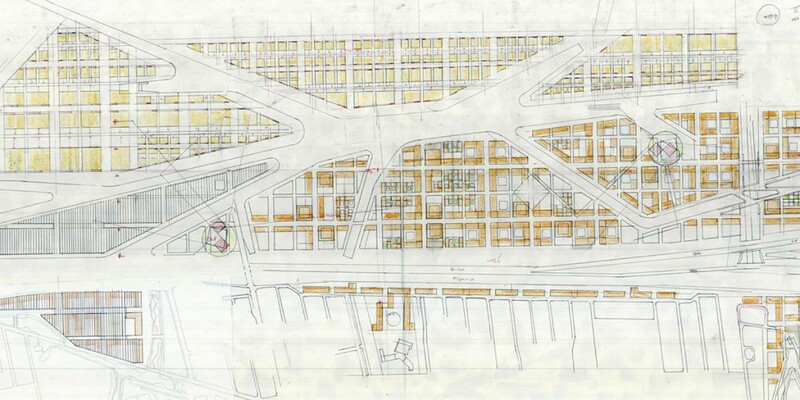 As large areas of former industrialized zones are rationalized into more compact and efficient zones, large areas are freed up for residential and commercial development, in turn freeing funds and impetus for the infrastructural topographical network. Again, this network, as it progresses, attracts further development of large zones. Past collusions have resulted in an existing infrastructure that cut neighbourhoods into parts, severed with circumstantial roads and dead ends, making improper conditions of backs and fronts and lacking in qualities and protocols. This new network offers a functionally integrated and bundled infrastructure – of novel ecologies of water storage, fast and slow movements working together, new linkages for a next generation of city building from a more plural environment, ecological and infrastructural direction. Not simply a subsystem, Undercover Montreal is an isotropic, intentional and opportunistic relational network marking contact between communities. 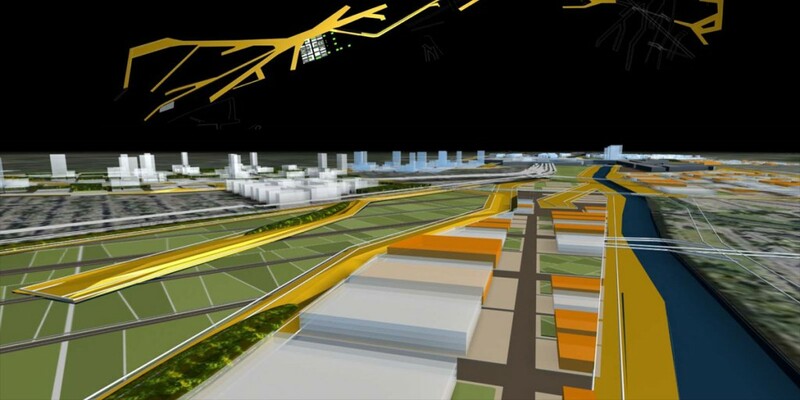 YUL-MTL: Moving Landscapes was an international ideas competition that aimed to develop strategic visions for the development of a 17 km corridor between the Montreal-Trudeau Airport and the city’s downtown.